अंग्रेजी शीर्षक लिखते समय वर्तनी (spellings) का विशेष ध्यान रखें । भजन के खोज परिणामों में प्रगट होने के लिए यह बहुत महत्वपूर्ण है । उदहारण के तौर पर अगर आप "शिव शंकर मेरे कब होंगे दर्शन तेरे" भजन जोड़ रहे हैं तो अंग्रेजी में इसका शीर्षक होगा "shiv shankar mere kab honge darshan tere"
Website modulator may reject your bhajan if it is already there on the website even if it is sung by different singer. 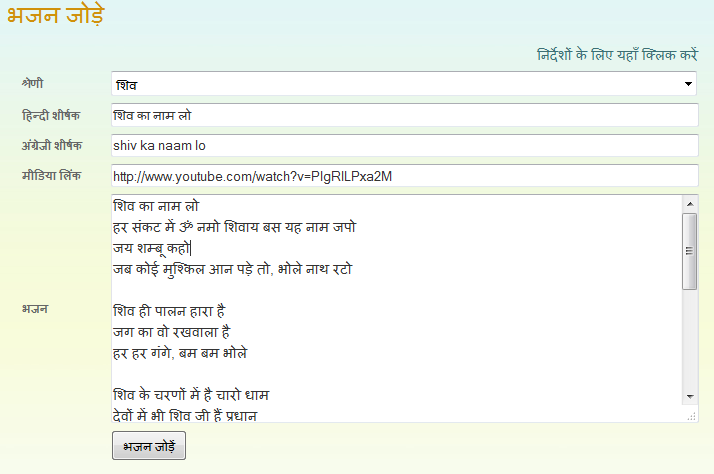 Website modulator may reject your bhajan if you typed incomplete lyrics. The video link you provide, may be changed by website modulator. Based on the volume of requests we receive, the bhajan you add may get delayed in approval process. Bhajans with good quality video links and full lyrics are likely to be added first.